Are our current ways of talking about "the problem of adolescence" really that different than those of past generations? For the past decade, Act Your Age! has provided a provocative and now classic analysis of the accepted ways of viewing teens. 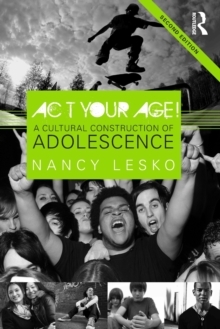 By employing a groundbreaking "history of the present" methodology that resists traditional chronology, author Nancy Lesko analyzes both historical and present social and political factors that produce the presumed "natural adolescent." This resulting seminal work in the field of youth study forces readers to rethink the dominant interpretations on the social construction of adolescence from the 19th century through the present day. This new edition is updated throughout and includes a full new chapter on 1950s-era assumptions about adolescence and the corresponding connections to teens today. As in all chapters, Lesko provides careful examination of the concerns of nationalism, sexuality, and social order in terms of how they are projected onto the definitions of adolescents in the media, in schools, and in the home.